What was a Wigwam? The Wigwam was a typical birch bark structure used as a shelter or house style that was built by many tribes of the Northeast woodland cultural group who made them their homes. Learn about the structure and the interior of the Wigwam with pictures and images with facts and information about the tribes who used them, including the Abenaki, Sauk, Fox, Ojibwe (Chippewa) and Wampanoag. The picture is of a Chippewa (Ojibwe) village at Sault Ste. Marie on the St. Marys River in Ontario, Canada in 1846. What does the word Wigwam mean? Definition: The word Wigwam derives from the word used by the Abenaki tribe meaning house. The wigwam, also known as a 'wetu' or Birchbark house, was a form of shelter and home used by various Native American Indian tribes, notably those who lived in the Northeast woodland. The wigwam was usually a round, dome shape structure that was 8-10 feet tall and 12 - 14 feet across. Wigwams were constructed by Algonquian-speaking people using a wooden framework of poles that were covered with sheets of birchbark, and other available materials such as tule mats, animal hides and blankets, which were held in place by ropes or poles. 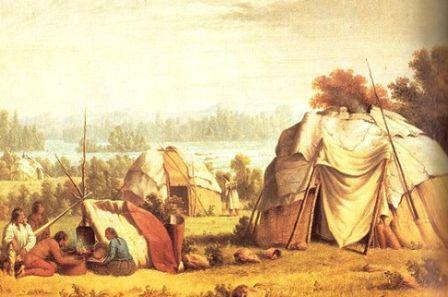 Canvas was sometimes used to cover wigwams starting in the late 1700s. What is the Difference between a Wigwam and a Tepee? The woodland tribes had access to forests and used birch bark as coverings for their wigwams. The Great Plains tribes had access to the bison and used buffalo hides as tepee tent coverings. Who lived in a Wigwam? The Wigwam was generally used as a shelter by the Native Indian Tribes who lived around the Great Lakes and the East Coast who had access to birch bark from the abundant forests and woodlands in their territories to enable them to build their wigwams. The names of the Algonquian tribes who lived in the wigwam style house included the Wampanoag, Shawnee, Abenaki, Sauk, Fox (Meskwaki), Pequot, Narragansett, Kickapoo, Ojibwe (Chippewa) and Otoe (Winnebago). Wigwams were suitable for tribes who stayed in the same place for months at a time. The Algonquian-speaking Northeast Indian tribes who used wigwams lived together in villages during the farming season tending their crops of corn, pumpkin, squash, beans and tobacco. During the hunting season small family groups would move to hunting camps. When a family moved to a new location, the frame of the wigwam was left in place and suitable coverings were taken with them. When the family returned they simply unrolled the covering they always carried, and placed it over the frame. If a wigwam frame was not available, they would make a new one. Some of these tribes went on to adopt the fortified villages of Longhouses (used by the Iroquoian-speaking tribes of the Iroquois Confederacy) to offer defence from hostile tribes. The shape of the wigwam was generally a round, dome shape with a round roof. However, tepees were also built in a pyramid shape as can be seen by the following pictures. Why was the Wigwam built as a Native Indian shelter or house style? Every tribe choose a type of housing to suit their lifestyle, the climate, the environment and the natural resources (known as biomes) that were available to them. The wigwam was chosen as the most suitable type of shelter and house style because it suited the lifestyle of the tribes who lived in the woodland areas, was easy to build and made good use of the trees in their locations. How was a Wigwam built? The basic materials used to build a Wigwam were the branches of flexible trees, or saplings. About 16 holes were dug around a circle 12 - 14 feet across. The holes were dug into the ground about 8-12 inches deep. The sapling poles were placed firmly in the holes then bent in an arch to form the dome shape of the wigwam. The poles of the frame was lashed together with tough bark fibers of the basswood tree. Hoops (ribs) were then fastened over the frame. Birchbark sheets were then tied to the framework to form the roof and walls. A layer of thatch, or dried grass, was sometimes placed over the birchbark for added protection to the dwelling. Woven tule mats, hides, canvas and blankets also covered the wigwam if these were available, kept in place by ropes and poles. Space was left for a doorway with an entrance flap that allowed people to creep into the wigwam. A smoke-hole from the top allowed smoke from the fire to escape, and fresh air to circulate. A 3 feet central hearth, consisted of a fire pit encircled by stones, heated the wigwam in cold weather, and was used for cooking in rainy weather. Sleeping platforms, with beds were made with dried grasses and covered with deerskin, were constructed at least half way around the wigwam and used as seats during the daytime. The space beneath the platforms were used for storage. Woven mats or deerskins were used as floor coverings.